In a way, this post is not about poetry at all. And then, in some ways, it is. Those who know me in the physical world or follow/happen upon my infrequent blog posts at this site or read my all-too-frequent social network status updates may remember that , in January 2014, I had hip replacement surgery. Now, in a bid for equality, my left hip is demanding the same rights as (erm) the right (and, after a life-time of differing leg length, I’m hopeful that surgical wizardry will bring about equality that respect, too). So, on 3rd Sept (yes, on a Saturday), we (my wretched joint and I) are (jointly) going under the knife (sorry folks – am giddy with excitement). It’s an understatement to say – we can’t wait! We’ve had our hopes raised (an end-of-May op date) only to be dashed (said op deferred – nothing to do with an NHS in crisis and everything to do with a low blood count) but we’re nearly there, now: fourteen days and counting down. Bring it on! My annual fiddle ‘fix’ that is five days of music-making, merriment and mayhem with friends at Burwell Bash traditional music summer school (my second enforced ‘gap year’ out of fifteen). A day trip to London, its endless possibilities – the Royal Academy’s summer exhibition, for instance. Keeping the garden in check. The Free Verse Poetry Book Fair at Conway Hall in London. …and, not least, sharing/discussing/workshopping poetry at my regular groups: Soundswrite women’s poetry group and South Leics stanza. I’m hoping that cabin fever doesn’t hit me too hard (my husband and I will be effectively housebound for six weeks while I’m unable to drive). I’m hosting a MacMillan Coffee Morning for a group of ex-colleagues (oh, how I’ll miss my coffee shop caffeine-&-cake) and I’ve already had one or two very kind other offers from friends. I’ll be doing the household shopping online for the first time (I actually like doing the supermarket shopping). When the general anaesthetic and other prescribed drugs are out of my system I plan on doing more reading – a novel or two (Donna Tartt’s The Goldfinch, for one), the odd poetry magazine (having renewed my subscription to Magma) and several hitherto unread anthologies are waiting in the wings. Then there are the MOOCs I mentioned in a previous post. And my physio exercises will take priority, of course – the key to regaining full range of movement and muscle strength. And life as I knew it. In my last two blog posts my aim was to bring readers up to date with my reading activity over the last few months. I do so much poetry reading that, at times, I wonder whether it becomes a displacement activity for writing. In my work life, I like the challenge of a deadline. If I have all the time in the world in which to write I’ll take forever to get down to it. If, however, I have a remit and a due date I work much better. That’s why I like the challenge of a writing commission. As winner of the Bru Leicester Writes poetry prize I was granted a writing residency and commissioned to write a sequence of five poems on the theme of Life in the City. What’s not to like? A busy, bustling city base from which to soak up the atmosphere/people-watch, a first-floor bird’s-eye view of city-centre street life, a paid commission, space and dedicated time to write – with coffee and cake to hand (those who know me know…) and a gift card to spend on eats and drinks at the till. Although I did a fair amount of online research for my poem sequence, inspiration came mainly from my walks between the rail station on London Road (or, more often, Dover St car park) to the Clock Tower (beating heart of our city) via Granby Street and Gallowtree Gate (with Bru Coffee conveniently situated half-way between these two points). I could have written a poem about any or all of Leicester’s famous names and nameless faces immortalised and memorialised in statuary. This one, for instance. In the end, I chose (or rather the destination chosen by my poem was ) Thomas Cook, whose statue greets rail passengers outside the station on London Road. Maria, a The Big Issue vendor no longer occupying her usual Granby Street spot opposite Bru, became the subject of a poem following a conversation I had with a regular customer and one of the baristas on enquiring after her whereabouts. Leicester’s Clock Tower is a babel of voices clamouring to be heard. And my LCFC poem? I confess to becoming a Foxes fan at least for the remainder of the season as our team’s path to Premier League King Power & Glory unfolded and I trawled the Twitter feeds around each nail-biting match. As the saying goes, you couldn’t make it up! 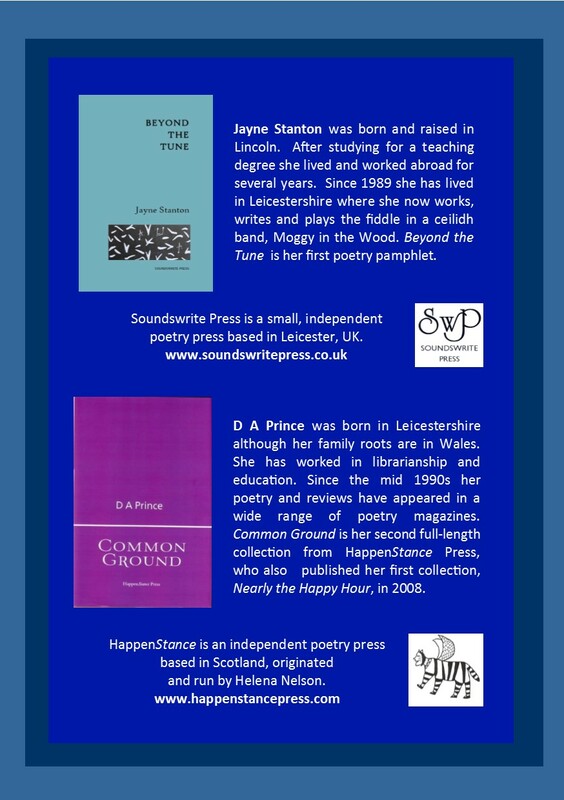 Three of my residency poems – The Art of Winning, The Big Issue and Time Traveller – will be published in Welcome to Leicester, an anthology of poems (Dahlia Publishing) to be launched on Friday 7th October as part of Leicester’s Everybody’s Reading festival. It’s free but bookable in advance (click here for details and scroll to page 23 of festival programme). With National Poetry Day falling slap-bang in the middle of Leicester’s Everybody’s Reading festival, I wish I could send out little pieces of me to all the concurrent events I’m missing, in order to attend/participate in others. Buy, hey, what a social whirl it makes for (and, for those who know me well, my poetry social life is a standing joke – in a nice way, of course)! Last night, nine women attended Cathy Grindrod’s workshop, Only Write What Only You Can Write, hosted by Soundswrite women’s poetry group as part of Everybody’s Reading festival – one of two free and open-to-all events we received funding for, this year. (2013’s ER workshop with Kim Moore was packed to the rafters). 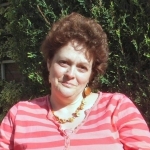 Cathy Grindrod is a widely-published poet and former Derbyshire Poet Laureate. 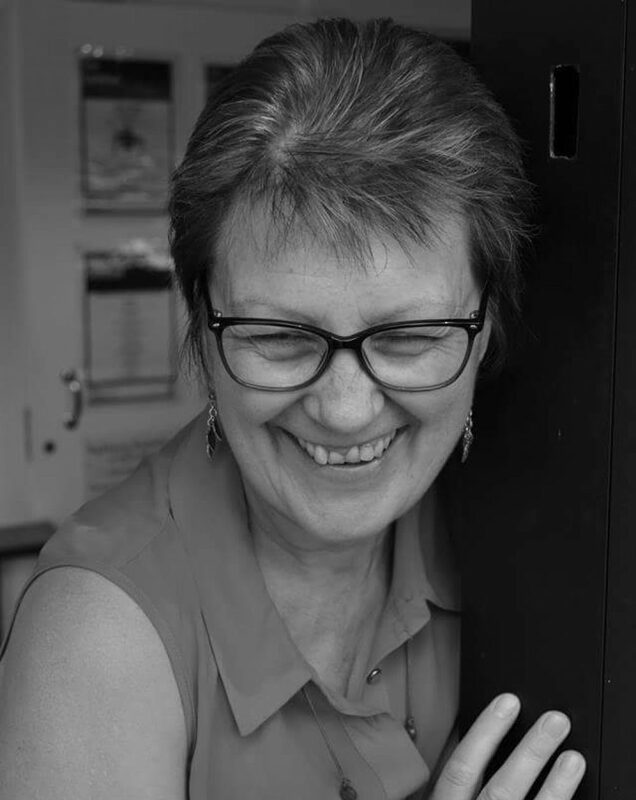 She also writes plays, scripts and literary fiction and works as a literature consultant, poetry tutor and mentor. I met her a couple of years ago when she ran a workshop for shortlisted candidates for a mentorship programme. (Under her guidance, I was able to hone my rather vague aspirations as an ’emerging poet’ into a finite list of achievable short-term aims). By way of introduction, we shared ways in which we, as writers, ‘keep the faith.’ These included attending writing groups to give and receive honest feedback, co-mentoring, and reading/sharing published work by others. During the course of the two and a half hour workshop, we explored ten ways that Cathy has found useful in her writing life. We spent some time reflecting on our personal beliefs and whether we felt these were evident in our writing. We were also invited to consider who we write for, and writing with the reader in mind. For me, this was a reminder of how easy it is too become too inwardly focused, to say nothing of the lure of publication in highly-regarded poetry magazines. And we discussed the importance of being ‘in the world’ and learning from others. I know I’ve benefitted most from writing groups that are outward-looking and have a keen interest in all that is current in the world of poetry, as well as the wealth of its past. At number four on the list was ‘recognising poetic snobbery’ – how refreshing! We each had our own view of what this constitutes. If we recognise it for what it is, we can set it aside. We also engaged in some short writing exercises. As well as coming away with a nugget or two, I’ve discovered new ways into a poem that I’m keen to use again. For now, will I be able to leave those nuggets alone for long enough to come back to them with a reader’s objectivity? Following last week’s pre-launch at Leicester Shindig, I’m really looking forward to the launch proper of my pamphlet, Beyond the Tune (see here). It’s also featured in Leicester’s Everybody’s Reading festival programme (see page 30, here). And here’s the Facebook event – more for your info than for firm numbers, as it’s an open event anyway – just turn up! It would make my afternoon if you were able to come along. Leicester is cranking up the gears for a week of (largely) free events with the aim (as it says on the tin) of getting everybody reading. There’s so much to choose from, catering for all ages and appetites from the avid to the most reluctant of readers. So, if you’re local, or within easy travelling distance of Leicester between 27th September and 5th October, why not click here to view or download the programme. And there’s an event on page 30 that I’m rather excited about: the launch of my pamphlet, Beyond the Tune (Soundswrite Press). 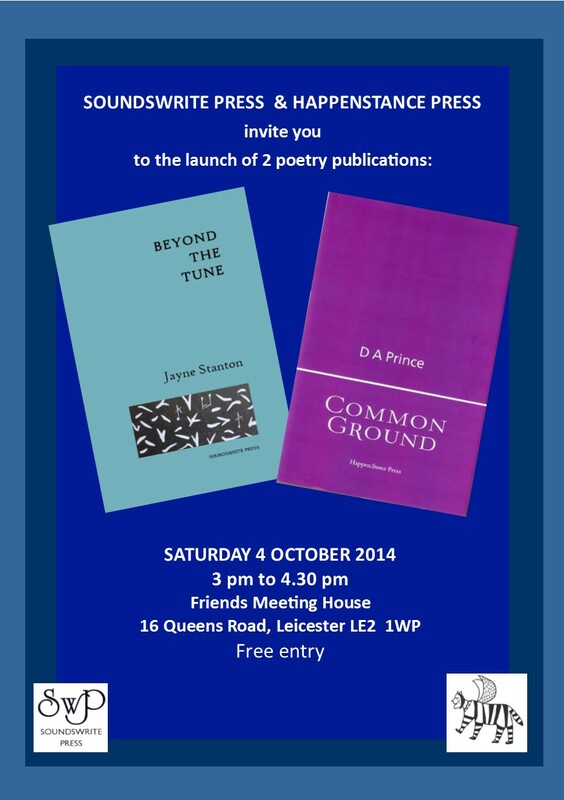 It’s a joint launch with Davina (D A) Prince, whose new collection, Common Ground, is hot off the HappenStance press. I’m delighted and flattered, and really looking forward to meeting Helena Nelson, too, if she’s able to make it on the day. And I’m assured there will be cake and liquid refreshment (I’m hoping for Earl Grey tea) and cake. It’ll make my poetry day to see you there, or at Shindig on September 15th, or both! There’s a launch flyer in the offing, to feature in my next blog post and further updates on Facebook and Twitter. As both diary dates are fast approaching, my To Do list Top 10 includes planning which poems to read and what to say. Any launch tips, via the comments box below, will be gratefully received.